Silent armoured personnel carriers that run on hybrid engines are being developed in Russia. Experts agree that this is a qualitative leap forward in re-equipping the Russian army. The new millennium has already seen dozens of small conflicts, counter-terrorist operations and peacekeeping missions. It’s clear that missile carriers and battle tanks are no longer enough to protect and serve the many large and small military bases that powerful countries possess around the world. Lightweight, high-speed wheeled and tracked, and even amphibious, armoured vehicles are needed in order to deploy special forces quickly, deliver everything necessary to war zones, and adequately protect military targets. And the most promising of these are wheeled vehicles, due to their simplicity and low operating costs, as well as their high degree of manoeuvrability and superior speed. In terms of tank construction, the Soviet Union – and now Russia – had no equals. The same cannot be said of armoured vehicles, the development and production of which has always languished far behind. Until now. 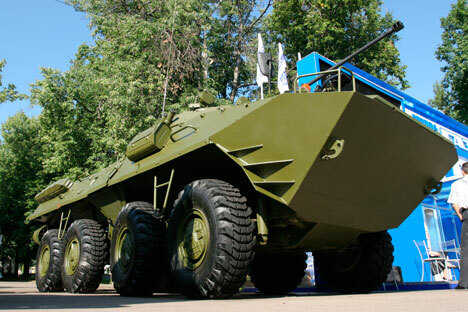 In late July, Russia’ Voenno-Promyshlennaya Kompania (‘Military-Industrial Company’, or VPK for short) announced that it had been developing, and was in the early stages of testing, a wheeled chassis for future armoured vehicles. The new project, called Krymsk, aims to eliminate the main drawback of current armoured vehicles, namely, the poor propulsion technology. What is innovative about the new vehicle is that the internal combustion engine drives the generator rotor, generating an alternating current which is then converted into a direct current. Next, energy is supplied to the traction motors through a system of transformers, resulting in the wheel’s rotation. At the same time, electrical energy is supplied to the molecular drive. When breaking, kinetic energy is converted into electrical energy that is also supplied to the drive. Armoured vehicles of this kind can move silently on molecular drives when the engines are turned off. At the moment, the power reserve is nothing significant; but if advanced lithium-ion phosphate batteries are used – they are already produced in Russia – then operating times may be increased by many dozens of times. Silent operation is an extremely important advantage of such armoured vehicles during covert operations. The armoured vehicle’s dynamic properties are no less impressive. During tests in the Greater Moscow area, the 22-tonne machine reached speeds of up to 97 kilometres per hour (roughly 60 miles per hour), and went from 0–80 kilometres per hour (0–50 mph) in just 33 seconds. Unfortunately, Russian current wheeled armoured vehicles are far from the standards mentioned above. There are only two machines in the ‘Armoured personnel and infantry fighting vehicles’ class, namely, the BTR-70 and BTR-80. But these are nothing more than ungraded versions of the BTR-60 series vehicles, which were developed back in the late 1950s. The main improvements of the BTR-70 and BTR-80 models are that they replaced the old petrol engines with newer, and more powerful, petrol engines – 120 horsepower for the BTR-70 and 210 horsepower for the BTR-80. In 1994, GAZ unveiled the new BTR-90 to the public. Serial production was supposed to start in 2011, but the Ministry of Defence sensationally abandoned these plans. Colonel-General Sergei Mayev, who was Director of the Federal Service for Defence Contracts at the time, had the following to say about the vehicle: “The vehicle has a checkered past. The prototype model was completed at the end of the 20th century, at a time when the military-industrial complex was falling apart […] and serial purchases of armoured vehicles had come to a halt […] State tests performed in 1996 showed that the vehicle did not fulfil all the tactical and technical requirements.” Evidently, the developers failed to meet the requirements of the military. Production of the BTR-80 has also been discontinued; it has also endured a less than stellar existence. If the course of Russian strategic weapon production is more or less clear, then the future of lightweight armoured vehicles now lies with the development of machines like the Krymsk.